Jordan had to go to work today (did I tell you he works at Great Harvest?) so I got up early (but not quite as early as him) and met him at the cafe where I enjoyed a fabulous muffin and a free cup of coffee! Then I went to JoAnn Fabrics for some bargain hunting! I’m not going to lie to you: I spent over an hour wandering the aisles, just touching fabrics, shaking bags of buttons, and smelling fake flowers. It was a wonderland. A fabulous wonderland. Anyway, I bought some supplies for today’s project as well as some impulse buys. First, I got a yard of purple flannel and some brown/green/blue/purple/pink plaid cotton to make a baby blanket for our friends’ forthcoming baby. Their son (below) was our ring-bearer and now they’re expecting a little girl! This picture is so cute I could die. Anyway, when little Julia arrives, I want to be ready for her! 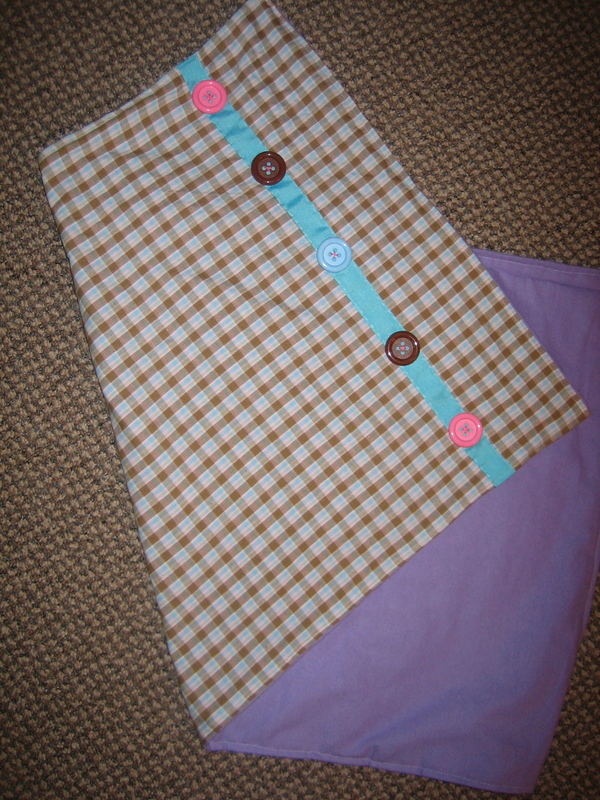 First, I cut two equal-sized rectangles of purple flannel and plaid cotton. 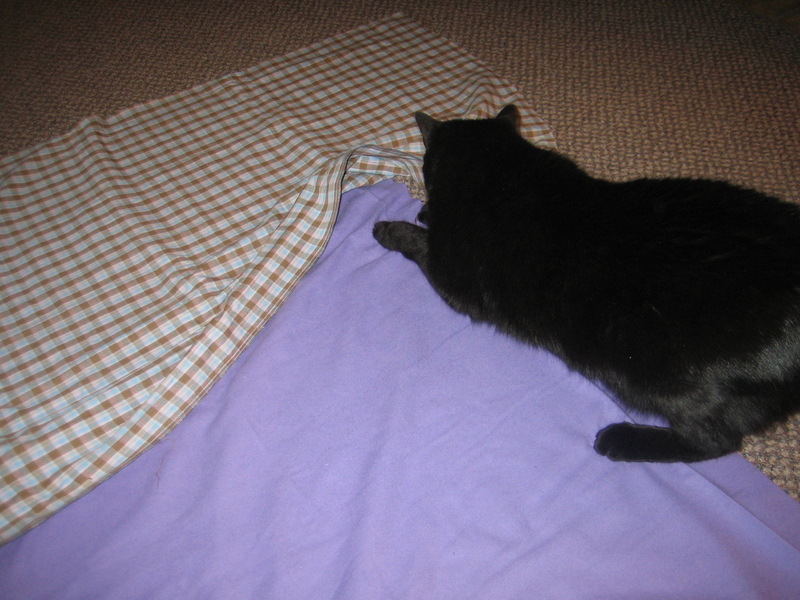 Sisko comes running as soon as I lay fabric on the ground to cut it. It’s like she can sense it, like she’s knows it’s there waiting for her to rub her paws and face on. She’s fab. So, back to the blanket. =P I cut the rectangles and then I sewed three of their sides together (wrong sides out) then turned it right side out and hemmed the last side. Finally, I did a running stitch around the other three edges to make it look nice. 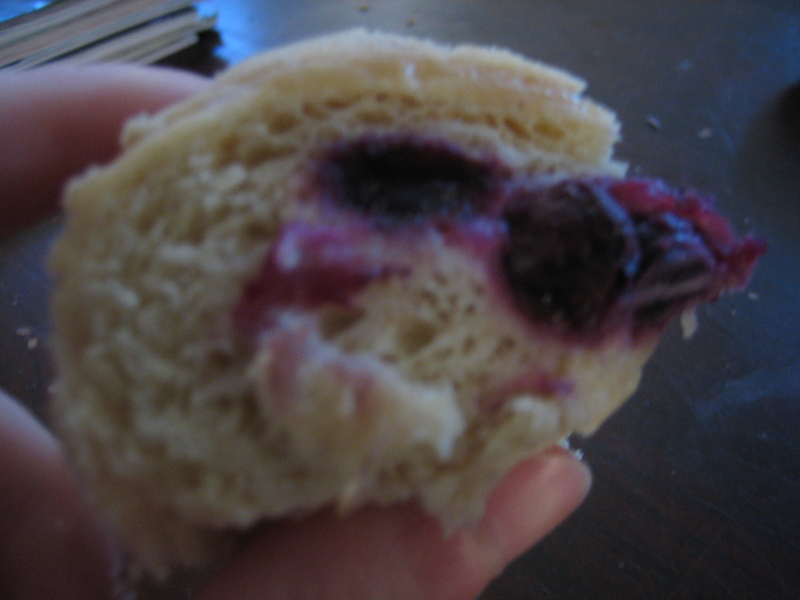 At this point, my camera’s battery died so I took a break and ate some blueberry pie bread. My camera took a while to charge so I don’t have pictures of these steps. Sadface. 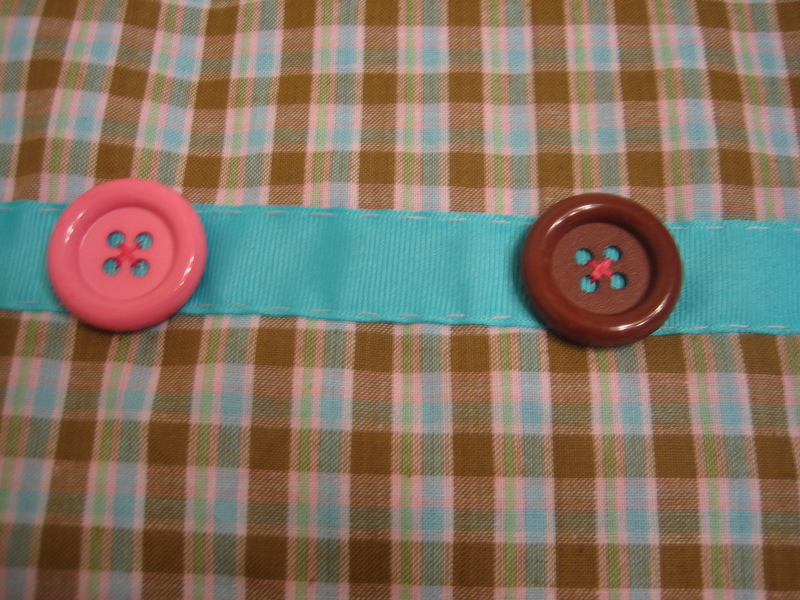 I sewed five buttons across a piece of sky blue ribbon and then sewed the ribbon near the top of the blanket. (Before sewing it down, I sealed all the threads at the back of the buttons with hot glue, just to be extra-sure they’d never come loose!) Here’s the final product! I love the colors and hope Julia does, too! Craft 16 of 52: Complete! In other news, I bought four remnants at JoAnn’s and wanted to share them with you! (Remnants are pieces of fabric that are less than a yard. They’re the very last bits on the bolt so stores usually sell them at a discount since there’s not too much there.) These were 50% off plus I had a 20% off coupon. Score. I love that green/yellow fabric in the back. In case you can’t tell, it’s got little girls playing dress-up on it! And I also love the kiwi/strawberry one! I think it would make a very cute apron…or something else kitchen-y. 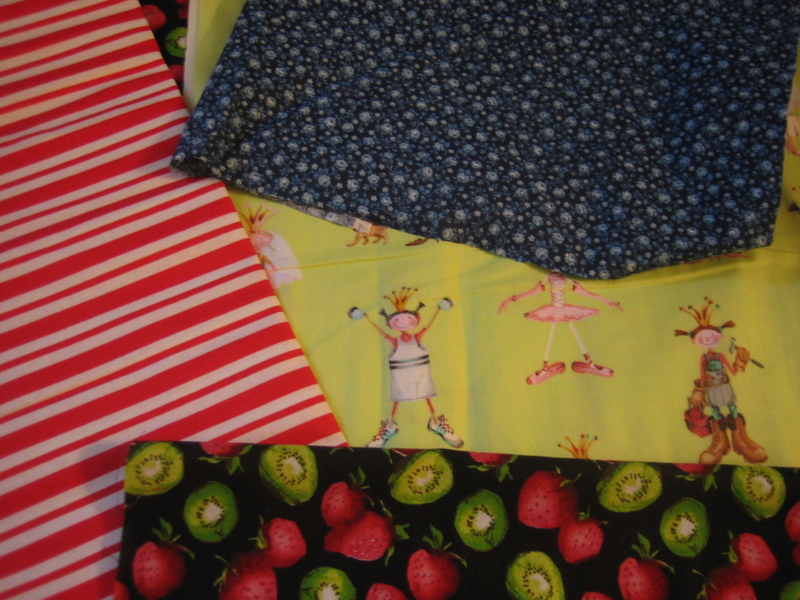 Leave me a comment if you have any good ideas for projects using less than a yard of fabric! That’s all for now, hope everyone enjoys this lovely day! Very nice! I love the remnant section at joann’s! Those remnants look good in the photo together–maybe you could make something out of them all together?